Edouard Manet is widely regarded as one of the founders of modern art due to his avant-garde imagery reflecting the aesthetics of contemporary life. But despite his modernity, he was in many ways a convinced traditionalist. He had a huge respect for the painterly skills of earlier artists - in particular, the school of Spanish painting, represented by the likes of Velazquez (1599-1660) and Goya (1746-1828) - and placed great importance on the value of studying and copying the works of Old Masters in the Louvre. Nevertheless, his relationship with the official body of French painting - the Paris Salon - was a stormy one. His radical masterpieces like Le Dejeuner sur L'herbe (1863, Musee d'Orsay) and Olympia (1863, Musee d'Orsay) were rejected by the Salon jury, as were several of his other works, while even those that were accepted (The Balcony, 1869) were frequently savaged by art critics and public alike. His Portrait of Emile Zola was painted during his transition from classical academic-style realism to the looser idiom of Impressionism. For more background, see: Realism to Impressionism (c.1830-1900). NOTE: Other celebrated paintings by Manet include: Portrait of Berthe Morisot (1872); Road-Menders in the Rue de Berne (1878); and A Bar at the Folies-Bergere (1882). Manet was introduced to Zola by the landscape painter Antoine Guillemet (1843-1918) in February 1866. Three months later Zola wrote an enthusiastic defence of Manet's work (L'Evenement, May 1866), which he later expanded into a long article (Revue du XIXe Siecle, January 1867). Manet painted this portrait as an expression of his thanks for Zola's support, and it was exhibited at the 1868 Salon. See also: Impressionist Portraits (c.1870-1900). 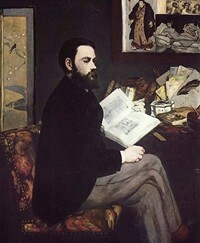 The painting shows Zola seated at his desk, on which is to be seen a copy of the pamphlet on Manet. As in the Portrait of Zacharie Astruc (Kunsthalle Bremen), the title on the book is also the artist's signature. On the wall above the desk is a lithograph, probably by the painter and engraver Celestin Nanteuil (1813-73), imitating Velazquez' masterpiece The Triumph of Bacchus (1628, Prado), more commonly known as Los borrachos or The Drinkers; a Japanese print entitled The Wrestler Onaruto Nadaeman of Awa province, by Utagawa Kuniaki II (1835-88); and an etching and aquatint version of Olympia (1863). Behind Zola is a Japanese screen, in the manner of Korin (1658-1716). The device of including an inset is common in Japanese Ukiyo-e woodblock prints of the 1840s and 1850s, where the subject enclosed in the cartouche is often intended to represent an oil-painting. For more background, see: Japonism (c.1854-1900). As Professor Theodore Reff has noted (Burlington Magazine, January 1975), the contrasting figures of Olympia, the wrestler, and Bacchus (in the Velazquez) look directly at Zola, who does not return their gaze. The importance of the objects surrounding the figure, attributes supposedly informing one about Zola, encourages the belief that they are expressions of Manet's own interests rather than Zola's, and Odilon Redon (1840-1916) observed penetratingly in his Salon review (La Gironde, 9 June 1868), "It is rather a still life, so to speak, than the expression of a human being". Zola himself was not entirely delighted with his portrait, which Manet presented to him, and Huysmans noticed that he had relegated the painting to an antechamber of his home. NOTE: For the full story behind French Impressionism and the group of young Parisian artists who created it, see our 10-part series, beginning: Impressionism: Origins, Influences.  Lady in Blue (c.1900) by Cezanne.